I stayed together with my cousins Lusia and Rózia and their father Shiye Glotzer for about one month. In July 1944 I received a notice to report to the Russian Recruiting Office. I was drafted into the Russian army. I never expected this to happen after what I had gone through. There were about 20 Jewish young men and also a group of Ukrainians who were drafted. In a way we, the Jewish men, could have escaped from being drafted, but our conscience did not allow us to do that. We felt that after what the German animals did to our people, we had a moral obligation to participate in destroying them. We had to go on foot, as far as to the outskirts of Przemyśl. There the Russian military officials gave us uniforms and shipped us on military trucks to near Rzeszów, Krosno and Jasło. There we were trained how to handle weapons. This area was behind the front lines. We were stationed there until about January 1945. 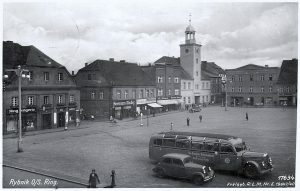 The town square of Rybnik under German rule in 1942. Source: fotopolska.eu. By then the Russian offensive had started. The Germans were retreating rapidly, but there was still heavy fighting going on. We advanced quite fast through Poland until we came to the German border. We took many German prisoners. We had an order not to kill German civilians. But we ignored this order. We felt that we were doing it for our killed families. Finally we made it to a town near Katowice named Rybnik. In the town of Rybnik very strong fighting was going on – practically from street to street, from building to building. We were in a three story building; I was on the first floor of that building. Suddenly an artillery shell hit the building and exploded on the first floor where I was. I was wounded in my left hand. I looked around for somebody to help me. I noticed that everybody around me was killed. Many of the killed men were my friends with whom I had come from Rohatyn. I was in terrible pain. Then medics came and I was taken away to the back of the fighting lines to a military hospital. They bandaged my wounded hand. I stayed there for a few days. Then I was shipped to another military hospital in Katowice. From Katowice they transferred me to a hospital in Lwów. 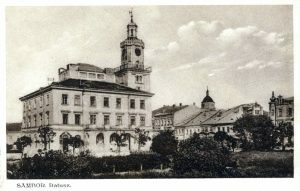 I was in the Lwów hospital for about two weeks. My cousin Lusia Glotzer found out what happened to me. She managed to come to Lwów. It was amazing that she made it to Lwów. When I saw her I could not believe my eyes. The Ukrainians were all over rebelling against the occupation of the land by the Soviets. She really sacrificed her life to come to me. She went with me to the officials of the hospital. She appealed to them to give me a leave for a few days so that she could take me to Rohatyn. The hospital officials granted me a leave. It was a very dangerous journey, but somehow we made it safely. I stayed with my cousins until the end of the war, May 8, 1945. After May 1945 I was recalled back to my division. I reported to the superiors in Lwów. There were rumors that we would be shipped to Japan. These rumors did not materialize, as Japan surrendered in the meantime. They sent us to the fields to help the peasants to work on the harvest. By then the Soviets had taken over the property of the farmers. Then we were shipped to Bukovina, a region in Romania. From Bukovina we were transferred back to Lwów. 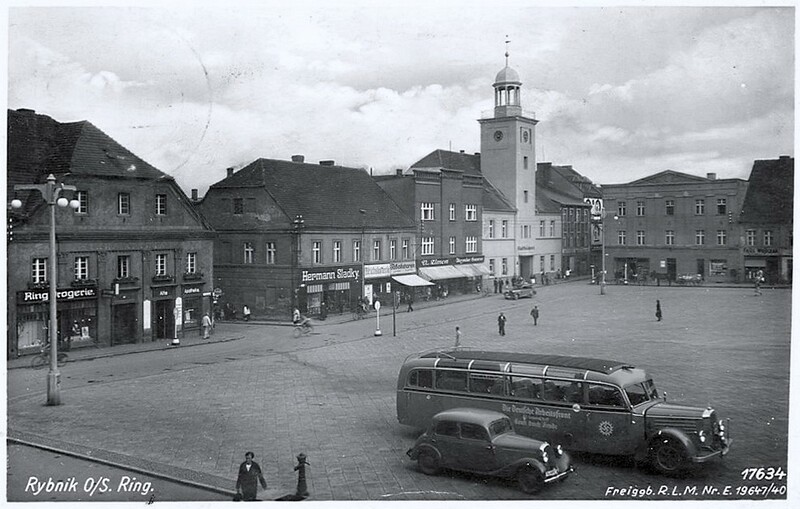 The Sambir town square and city hall before the war. Source: photo-lviv.in.ua. This was already the end of September 1945. From Lwów they shipped us to Sambor. We had no idea what to expect in Sambor. When we arrived there we were assigned to guard German war prisoners. That was what I was hoping for all the time when I was in the woods running for my life like an animal. Here I was in a Russian uniform with a rifle guarding my enemy who caused so much pain to me and my people. I could not believe my good fortune. My time for revenge had come. First of all I and other Jewish soldiers told the German prisoners that we were Jewish. Just to see the fear in their eyes was a pleasure. To watch them being hungry and cold gave us a lift in surviving to this moment. The Russian superiors watched the Jewish soldiers very closely; they knew what we were capable of doing to these animals. But watching them like this was a revenge nevertheless. We knew that when it became colder, they would be dying like dogs. We did have control over their food rations; they were dying of hunger. I was in Sambor until the beginning of 1946. We Jewish soldiers found out that by law we were Polish citizens; therefore we could be discharged from the Russian army. We registered ourselves with the Russian officials. One night in the beginning of 1946, we were sent to the outskirts of Sambor; we were told to go to the woods to look for Banderowce. All of a sudden a Russian soldier came riding on a horse and calling out my name. When I approached him he told me that I was ordered to report to my division in Sambor. I went back to Sambor to my division superiors. I reported to them and told them my name. I asked why I had an order to report. Somehow nobody knew. That was very typical of the Russian army; the left hand did not know what the right hand was doing. I was very tired, so I went to sleep. In the morning I was awakened by my superiors. They asked me whether I wanted to leave the Russian army, and to go to Poland. I was afraid to tell them that this was what I wanted (for fear of being considered as an anti-Soviet). But I told them that I was very tired and my family was very anxious to see me. They gave me a loaf of black bread and two herrings and told me “to leave immediately and that I was officially discharged”. I hitchhiked back to Rohatyn; it was around March 1946. To view a copy of this license, visit http://creativecommons.org/licenses/by-nc-nd/4.0/ or send a letter to Creative Commons, PO Box 1866, Mountain View, CA 94042, USA.